One of our clients’ favourite moments when chartering a luxury yacht and discovering each destination is making exciting culinary voyages. As brokers, we just love finding and recommending to you the best places to eat and drink. Whether you are sipping a refreshing cocktail by the pool, spending an afternoon at a beach club or indulging in a gourmet dinner, we set our standards high to help you create the best memories. Being part of the Caribbean, the Leeward Islands are home to a wide choice of famous branded resorts that are renowned for offering high quality taste experiences. Here’s a flavour of what exciting choices await you. Villa Marie is situated in St Barts, an island synonymous with exclusivity and attracting the jet-set. 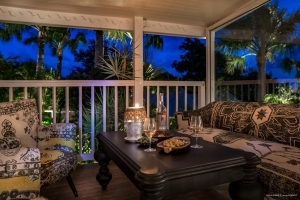 The property, formerly known as Hotel François Plantation, offers guests a secluded retreat with magnificent sea views and has become historically acclaimed as one of the island’s famous culinary hotspots. Re-opening last March, the speciality of the restaurant is in blending Mediterranean traditional techniques with predominantly Caribbean flavours and colours. If you have already chartered in the French Riviera and tried a Bouillabaisse, then you will feel right at home here, whilst being pleasantly surprised by its distinctive Caribbean style. If not, then this is a good place to start and discover this fantastic dish! 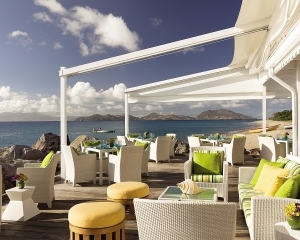 Park Hyatt St Kitts Christophe Harbour has three dining options. We heartily recommend that you try The Fisherman’s Village, either for lunch or dinner. Unsurprisingly, The Fisherman’s Village’s menu showcases a large choice of local fresh caught fish. Here you can discover the authentic taste of the Caribbean, with the menu reflecting every possible flavour and ingredient combination of the region. 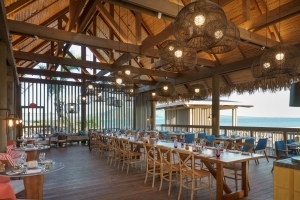 A stunning panorama of the beach and ocean combined with impeccable service are the other things we particularly like about the open-air Fishermen’s Village restaurant. If you feel like a seafood alternative and a more formal service, you may wish to head to the Great House. For a gastronomic delight, the Stone Barn restaurant at Park Hyatt caters exclusively for adults and offers an exciting dinner menu. 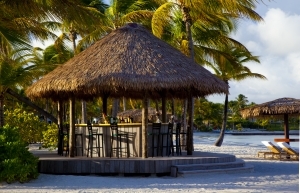 The other big-name resort of Nevis Island is Four Seasons, a brand famed for its excellent standards of luxury service. Stepping in this property is an experience that feels out of this world. From the beach and the rum bars to the casual restaurants, the resort has several dining options that are all simply mouth-watering. The dinner-only restaurant, Mango, is our preferred choice and ticks all the boxes our clients come to expect when chartering. The waterfront restaurant is also the perfect place to be amazed by beautiful sunsets. Here the menu is short but according to our experience, this is the best indication that the dishes served are mastered and fresh. The restaurant’s cuisine is 100% Caribbean and Creole-influenced and designed by the award-winning Chef Rodelle Rawlins. At Mango, Sundays are special. From 11:30 am to 3:00 pm the team puts on Reggae Brunches, offering a real cultural experience as the upbeat sounds of live reggae music play on till dusk. Then from 6:00 pm onwards, the restaurant takes it to the next level with its rum-pairing dinner. Why not try the Mango’s famous BBQ ribs served with coconut coleslaw and sweet potato Jerk Fries? It makes a great pairing with a Ron Zacapa 23-year-old rum from Guatemala. A taste of Caribbean heaven. Lying further south in our culinary exploration of the Leeward Islands, we stop off at the recently re-opened Jumby Bay resort. The resort can be found at a 300-acre private island, Long Island, just off the coast of the mainland and is only accessible by boat. Long Island and Jumby Bay are one of the best anchorages to escape and unwind as you enjoy Jumby Bay resort’s facilities. In the morning, as you wake up to the glorious setting of Jumby Bay, you may decide to jump on the tender and spend the day relaxing on the beach where you can enjoy street food style cuisine inspired by authentic West Indian influences such as chicken rotis or fresh ceviche. Or you may opt to spend the day off-shore and practice water-sport activities before heading to the highly gastronomic Estate House restaurant for dinner perhaps.